This past year (2017-18), the Environmental Science program created three new undergraduate award opportunities for students majoring in Environmental Science. To receive one of these awards, the current procedure is based on faculty recommendations and qualifications. Each award comes with a certificate, a cash prize, and recognition at the annual departmental commencement reception. If you have any questions about these awards, or would like to submit a nomination for a student for the next selection cycle, please email Rachel Levitt at RLevitt@clarku.edu. This award is given to a graduating senior Environmental Science major in recognition of outstanding academic achievement. Selection Criteria: candidates will be evaluated based on the following factors listed in order of descending priority: 1) academic excellence, 2) commitment to breadth and depth in the field, and 3) involvement in intellectual life outside of the classroom. This award is given to a graduating senior Environmental Science major who has delivered excellent research within the field of environmental sciences during the course of their undergraduate study. Selection Criteria: candidates will be evaluated based on the following factors listed in order of descending priority: 1) research excellence, 2) exceptional interest and ability in scientific inquiry, and 3) commitment to pursue scientific research and applications. This award is given to a graduating senior Environmental Science major in recognition of distinguished effort to improve the way humans interact with the environment, natural or built. Selection Criteria: The recipient will have worked in close concert with an outside organization (e.g. government agency, NGO, etc.) putting her/his academic preparation into practice to address a real-world issue in environmental science. Check back throughout the semesters to view upcoming events sponsored by the Environmental Science program! In the meantime, if you are a current student/prospective major or minor and would like to view our ES Forum via Moodle, please contact RLevitt@clarku.edu to request access. The Environmental Science program was happy to host the first ever Practicing Environmental Science event on Wednesday, April 4th 2018! This event was a fantastic opportunity for undergraduate students interested in Environmental Science to network with local employers, to see how the skills you acquire in your classes at Clark be applied in the field, and to meet and connect with alumni who have had a myriad of exciting experiences in their journeys after Clark. This event was a series of consecutive sessions that took place on April 4th – each session was free and open to all. Click here to see the 2018 event schedule, and be sure to check back once the semester begins for more information around our next event! Click here to view the ClarkNow article featuring this event! 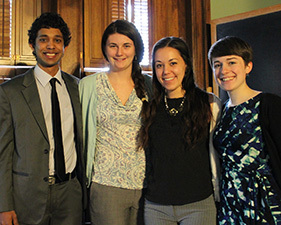 On April 23, 2015, four Environmental Science majors successfully defended their honor’s theses with excellent presentations and even better performances in answering questions afterward. Erin Miller (BA ’10 Environmental Science/MA ‘11 ES&P) a former student of John Baker, is putting to good use her interest in the impact of urbanization and development on the ecological functioning of freshwater systems that she developed while a student at Clark. Richard King, who worked with Erin on projects exploring the efficacy of invasive species controls, helped her to get an internship with the USFS at Lake Tahoe, which, he reports, she quickly turned into a full time job. Now employed as a US Forest Service Biologist, Erin is currently spending much of her time literally in the Truckee River, collecting thousands of Western Pearl Shell mussels for relocation to a new river channel which has been engineered by the USFS to mitigate disturbance to the watershed incurred by urban development in the area. Rich sent along a link to a story about this project, highlighting Erin’s role in it. Check it out! In March 2015 Lynn McNamara visited John Baker’s Management of Invasive Plants course to discuss issues involving (not surprisingly) the management invasive plants. Since 2008 Lynn has been working as a Critical Lands Manager for the Nature Conservancy in northern Vermont. She took her Bachelor’s degree in Environmental Science from Clark, then focused on the ecology of invasive plants for her Master’s thesis at Antioch University. ES director, Professor John Baker, announces that the ESSAC student group has now been formally recognized by the university. These students, ranging from seniors to sophomores, are active in linking the Environmental Science faculty to the student body, keeping the faculty informed on many student issues and concerns. They meet monthly, and have planned the event shown in the attached flyer. In the fall they will organize events for new students contemplating ES as a major. Follow ESSAC on Moodle. Christina McGraw joined the Chemistry Department as Assistant Professor of Environmental Analytical Chemistry. Dr. McGraw will be teaching Introductory Chemistry and Environmental Chemistry courses. Dr. McGraw arrived at Clark from a postdoctoral position at the University of Otago in New Zealand. She obtained her Ph.D. in Analytical Chemistry from the University of Washington and spent a year at the National Centre for Sensor Research at Dublin City University in Ireland before heading south to New Zealand. During her five years in New Zealand, she developed new analytical instrumentation to study the local impacts of ocean acidification. She is continuing this work at Clark, developing new sensors for marine and freshwater research. Further information can be found on her faculty bio. Dominik Kulakowski, Assistant Professor of geography at Clark University, recently testified before a subcommittee of the United States Senate. Kulakowski was invited to testify about his research on the influence of bark beetle outbreaks and climate on fire risk in the western U.S. This ongoing line of research is funded by the National Science Foundation and has involved numerous Clark graduate and undergraduate students. Most summers Kulakowski and a team of Clark students visit the Colorado Rocky Mountains to collect data on the ecology of those forest ecosystems. This research is centered on the large outbreaks of native bark beetles (Dendroctonus spp.) that are occurring throughout coniferous forests of western North America, from western Alaska to the U.S. Southwest and that have led to widespread public concern about increased fire hazard following beetle outbreaks. Kulakowski’s research examines possible feedbacks between wildfire and bark beetle outbreak across different spatial scales and under varying climatic conditions. Work on such feedbacks is a high priority in improving the predictive capacity of ecology, in particular in relation to large-scale disturbances that potentially can affect vast areas of forest. This project is improving the understanding of the influence of beetle outbreaks on future fire risk under varying climatic conditions, which is of broad current interest to resource managers, law makers, the fire mitigation community and the public living in the forests of wetsern North America. Major national initiatives of fire risk mitigation and suppression, with annual expenditures on the order of $1 billion are currently being implemented in the western U.S. However, specific management goals and expenditures are being driven by untested assumptions that beetle kill dramatically increases fire risk. This project examines such assumptions and analyzes the role of factors in addition to beetle kill that affect fire risk. In June 2010, Assistant Professor of Environmental Science and Policy, Jennie Stephens was invited to Tsinghua University in Beijing China to give a talk at the School of Public Policy and Management on her work on the social dimensions of energy technology deployment. While she was there she also worked to develop a new collaborative research project examining different visions and applications of Smart Grid technology. Photo: Jennie Stephens, Assistant Professor of Environmental Science and Policy, with one of her collaborators Tarla Rai Peterson on the Great Wall outside Beijing China. While in China, Professor Stephens worked on a new collaborative project exploring Smart Grid and the socio-political complexities of enhancing electricity systems. In this photo, behind Stephens and Peterson electricity transmission lines are traversing the Great Wall. Assistant Professor of Environmental Science and Policy, Jennie Stephens, has been supported by the Swedish MISTRA Foundation for Strategic Environmental Research for her participation to an international collaborative research project on the politics and social dimensions of carbon capture and storage technology. Through this initiative, Jennie has co-authored two recent publications in a special issue of the journal Global Environmental Change. She is the first author of an important paper that critically assesses the international CCS community and its capacity to consider negative critiques of CCS technology. ES&P graduate student Yue Liu (ES&P ’11) also contributed to this project and is one of the co-authors on this paper. As part of this MISTRA project, Jennie is also a co-author on another paper on social learning associated with CCS demonstration projects. This year, Jennie Stephens presented papers at several conferences including the 10th International Greenhouse Gas Control Technology Conference (GHGT-10) in Amsterdam, the Netherlands in September 2010 and the Association for Public Policy Analysis and Management (APPAM) 32nd Annual Research Conference in Boston Massachusetts in November 2010. Professor Karen Frey is featured in a four-part NOVA special talking about her climate change research in the northern Bering Sea. She was filmed aboard the U.S. Coast Guard Cutter Healy, a 420-foot icebreaker that supports National Science Foundation-funded scientific missions in arctic marine environments. The Polaris Project gives undergraduate students the opportunity to witness the changing Arctic first-hand as they participate in a field course and research experience in northeastern Siberia. After completing the "Arctic System Science" course associated with the Polaris Project (GEOG 119), a select group of undergraduate students travel with project scientists to the Siberian Arctic. Students in the field course are introduced to a variety of arctic environments including boreal forest, tundra, lakes, rivers, estuaries, and the coastal ocean, conduct their own mini research projects, and help project scientists plan extended field courses. The interdisciplinary approach emphasized throughout the Polaris Project mirrors the way that complex environmental science is actually done. We’ll stress the links between the different environments and explore how climate change is impacting them. Students will work closely with leading scientists and share in the excitement of scientific discovery. The Polaris Project will be superb preparation for students wishing to pursue graduate studies in environmental sciences, but we seek a diverse student body which might also include non-science majors. The Polaris Project has become an exceptional learning experience and tremendous adventure for all participants. Students see an extremely remote part of the world, get a first-hand view of "global warming," conduct their own research project, and be part of a team of enthusiastic undergraduate students and scientists working together to understand the changing Arctic. If climate change, the Arctic, adventure, and teamwork appeal to you, please apply to participate in the Polaris Project. For more information, contact Dr. Karen Frey (kfrey@clarku.edu) or visit www.thepolarisproject.org.